Today is The People's Climate March day. 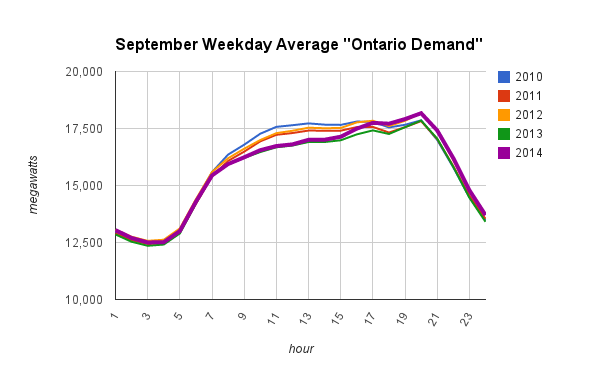 Not being much for marching up and down the square, I thought I'd be better to write about the accomplishments and challenges in my province of Ontario, where this weekend may well be experiencing the lowest emissions from electricity generation in over half a century. It's certainly the lowest emissions since I started capturing hourly data, which I have from September 1st, 2010. The reason is the scheduling off of non-utility generators, many of which are fueled by natural gas. Prior to yesterday the lowest value I'd seen for generation fueled by natural-gas was 291 megawatts; yesterday it dropped below that level in hour 3 and just rose above it as I write this (hour 8 of the 21st). I'm not certain the now closed Hearn and Lakeview generating stations would have operated at less than 200MW combined, so this really might be as low emission a day as Ontario saw in the past half a century. 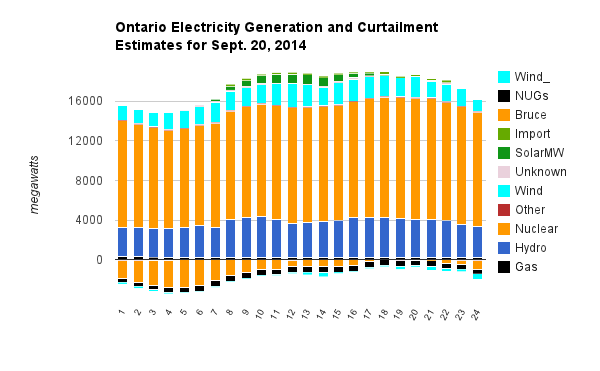 September 20, 2014, Ontario was a net exporter of more electricity than it has been since the market opened on May 1st, 2002. The average price was approximately nil. On average, net exports were 3,265 MW - much of it to New York where many of today's marchers oppose the nuclear source that usually powers their sockets without ever cluttering their air. 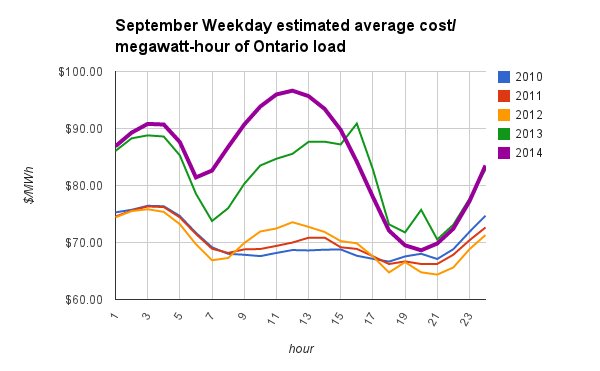 The combination of high exports at no price, and curtailed supply, prompted my sometimes collaborator Parker Gallant to e-mail me; "it would be fun to calculate what the cost of generating Ontario "demand" is costing per kWh at this moment." There's lots of problems in accomplishing that, but "fools rush in where angels fear to tread" - and it is fun to utilize this data store I've built. So, for Parker and myself, I've done it. I also summarized hourly data by weekday and month, right back to September 2010.
the algorithm assumes a percentage of self-scheduling (unknown) and other embedded supply, as well as a line loss. 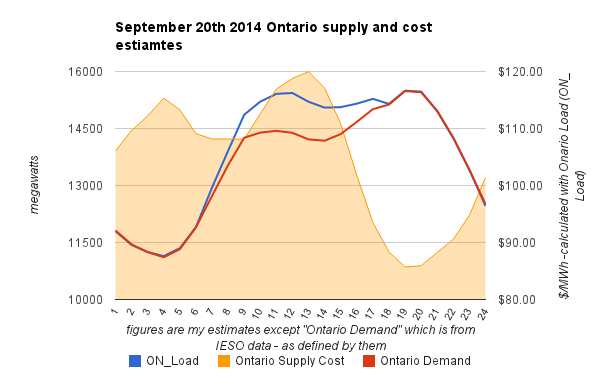 Ontario's "load" is an estimate of the billing consumption - the denominator for the total supply costs numerator in estimating a rate. Looking at summary data over a period of time, with one small difference in approach, strengthens my confidence in my techniques. The load shape is now similar in all years - this September shows a little higher, probably because it's partial month data with 2 of the year's hotter days included but cooler, lower demand days at the end of the month yet to come. 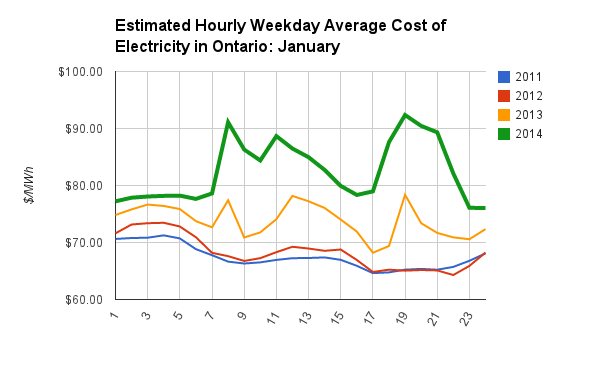 Here we see the cost impact of over-supply at night during Ontario's shoulder months, but it's still less than the cost impact of increased solar. 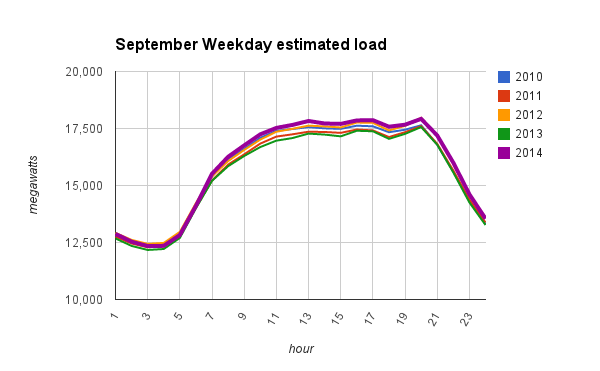 Bizarrely, looking at the last two graphs, while actual load is pretty flat from hour 11 to hour 20, hour 12 is the most expensive supply of the day, and hour 20 (the peak load) is the lowest price of the day. Also note this shape is not dissimilar to the graph for just September 20th. 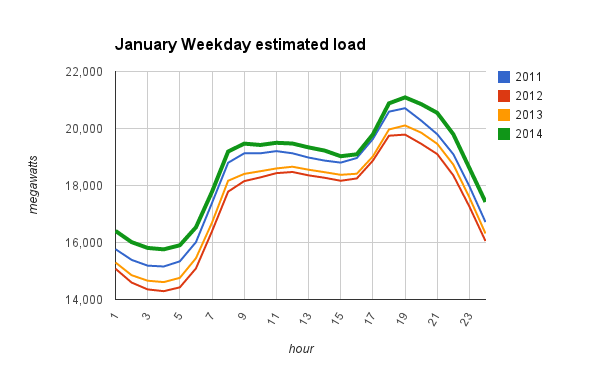 Finally, I'll show the load, and hourly supply costs, for the high demand winter month of January. The load ramps up quickly from hour 5 to hour 8 , and again at from hour 16 to a peak at hour 17. In January, the highest cost hours in 2014 were for the steep morning ramp, and the early evening peak - a much healthier picture of a market. 1. My May 2011 How the IESO is Managing Surplus Supply discussed most of the tools, but since that time the ability to curtail industrial wind turbines has been added to their tool set. 4. Parker Gallant recently wrote on the Ontario Power Authority's business plan, which shows a 2014 budget of $483.4 million for 2014. OPA annual reports show the figure has been in a tight range of $301-$335 million for the past 4 years, so the increase is enormous. 5. This, absurdly, puts the IESO's daily peak in the "off peak" rate pricing period for consumers of time-of-use pricing's regulated pricing plan. 6. This costing estimate does not include estimated charges for curtailed wind, or curtailed NUG - but nuclear curtailment costed at $60/MWh, is included. 7. In winter (after daylight savings time returns to standard time) hour 4 is the hour ended at 4 am - during daylight savings time (summer) hour 4 is the hour started at 4 am and ending at 5 am.